Industrial toxins and urban runoff have transformed the West Coast's largest estuary into a toxic soup, and a 21st-Century flood of microplastics and pharmaceutical residues is making matters worse. The challenges go on. In spite of the victory against Levin-Richmond, a push to increase coal shipments through East Bay ports is gaining strength, and sand dredging in the central Bay, near Angel Island, threatens seafloor habitat. The future will pose still another suite of challenges as the world's oceans rise. Eventually, the sea will swamp numerous contaminated sites on the shore of the Bay that are now high and dry. "What's going to happen when the water rises?" Choksi-Chugh said. From the cabin of the Baykeeper, Choksi-Chugh surveys the site of Manson Construction. "I wonder what it is they're doing," she said. A group of workers on the dock glance at the boat as it navigates through the tiny channel. She waves, and they wave back. Baykeeper hasn't ever sued their company, and they don't know each other personally, but it seems possible that someday they will meet in court. 100 Percent Trash Reduction — Laudable or Laughable? One morning last year, as the San Francisco Baykeeper departed the Oakland Estuary on a morning patrol, the boat almost immediately came to a halt as the crew stared aghast over a raft of floating trash about a half-mile wide — sort of a crude miniature of the central Pacific plastic gyre, which is formed largely of microplastics. 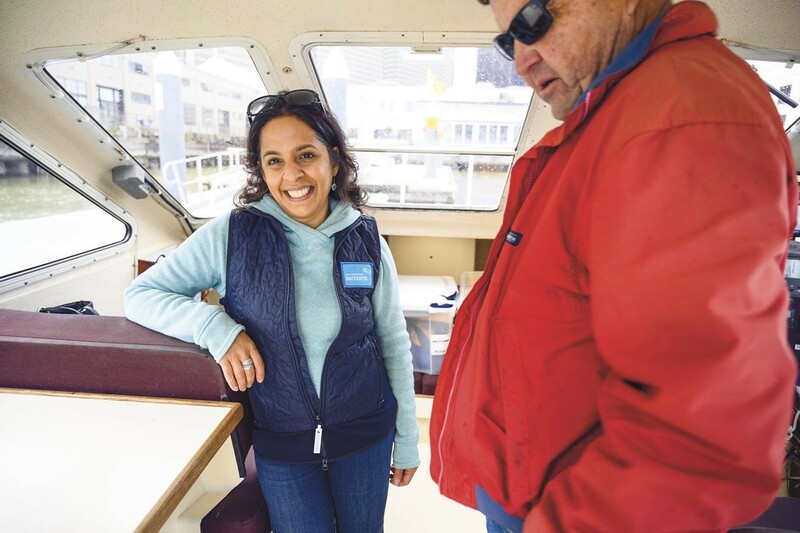 Choksi-Chugh recalls seeing a harbor seal break the surface, surrounded by rubbish, and turn its big-eyed Labrador gaze toward the boat. "I'm not trying to anthropomorphize, but this seal looked at us like, "Hey — what's going on?'" she said. That question would be well directed at the San Francisco Bay Area Regional Water Quality Control Board. This agency, part of an overarching statewide water management department, ostensibly enforces key tenets of the state's Clean Water Act and Environmental Quality Act, with a mission, posted on the agency's website homepage, "to preserve, enhance and restore the quality of California's water resources and drinking water." In 2009, the Water Quality Control Board implemented a plan to eliminate trash entering the San Francisco Bay watershed. In what seems a technical contradiction, the initiative aimed at eliminating trash is actually a "permit" to discharge it with specified limitations. Whichever way one looks at it, the Municipal Regional Stormwater Permit clearly states its goals: By July of 2017, cities were expected to curb their trash flow into waterways by 70 percent from 2009 levels. This July, according to the permit, local cities are required to hit an 80 percent reduction from stormwater trash flow a decade ago. By July 1, 2022, the law calls for "100 percent trash load reduction or no adverse impact to receiving waters." The objective aligns evenly with the Bay Area population's progressive and environmental values, but it isn't clear that the trash reduction initiatives have amounted yet to anything more than big talk. Depending on whom one asks, cities are either on track, or failing, to meet these requirements. According to a water board staff report from March, 2018, all but six of the 71 cities covered by the requirements — essentially every major community within San Francisco Bay's drainage — reported compliance with the law as of the 2017 deadline. Mumley said he expects all cities to report compliance with the 80 percent mitigation requirement coming up this summer. That should mean that Bay waters are now receiving just one-fifth the trash that flowed into them in 2009. Ian Wren, a staff scientist with Baykeeper, doesn't believe it. "Some cities are claiming more than 80 percent reduction in trash generation and discharges to the Bay, although there is little evidence these results translate to trash reduction in the Bay," he said. Wren explained that compliance with the permit is gauged on visual observations of trash in city streets, rather than the amount of trash that makes it to waterways and the Bay. "The approach is easy to manipulate and lacks transparency," he said. Wren's colleague, Erica Maharg, Baykeeper's managing attorney, also doubts the compliance reports from Bay Area cities. "While most cities have reported that they are meeting the trash reduction targets, we — and I think most residents around the Bay Area — know that trash continues to clog our streets and our waterways," she said in an email. "There clearly is some disconnect between the high reductions the cities are reporting and the reality on the ground and in the water." To stem trash flow into waterways as required, many municipalities have installed large trash screening systems, called hydrodynamic separators, in underground storm drain channels. These devices can cost roughly half a million dollars to install, Wren said, and they require maintenance as debris collects inside them. However, placed near major outflow points, they can be a cost-effective way of halting all trash flow originating upstream in urban watersheds. "By design, these trash capture systems work — they capture the trash," Mumley said. However, the assumption that a city using these systems has mitigated its garbage problem comes with a big asterisk. "If you've put in this system, does that mean you've adequately intercepted the pathway of trash from cities into the water?" Mumley said. "Maybe, but there's a question mark there." He said windblown garbage can migrate directly into waterways. Trash discarded directly into streams and the Bay also offset the effectiveness of installing these trash capture systems. Homeless encampments, according to several sources, are becoming a major cause of direct trash discharge into waterways that are otherwise protected by large trash capture systems. Measuring trash is a sloppy business, which could explain why cities complying with the stormwater permit are still filthy. "You can measure trash in a lot of different ways — by count, by volume, by mass, which varies whether it's dry or wet," said Tony Hale, program director for environmental informatics with the San Francisco Estuary Institute. Hale said cities each have their own method of measuring trash. "The data is therefore less likely to be comparable," he said. 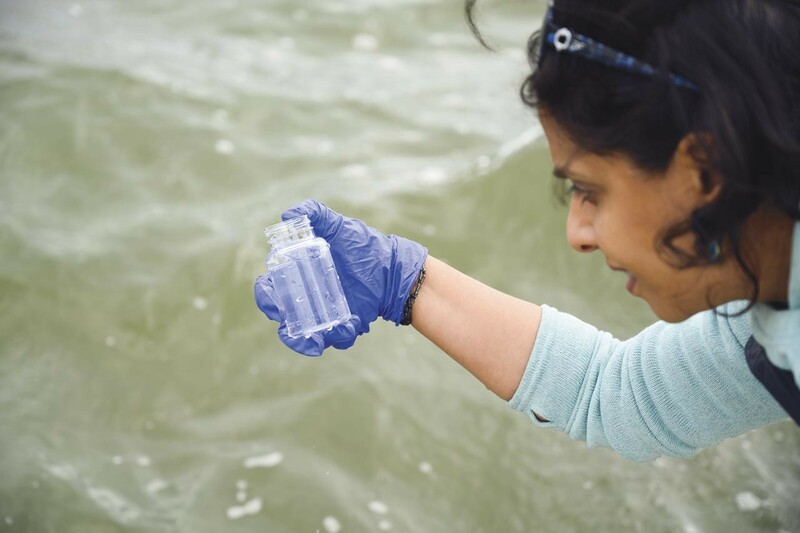 The San Francisco Estuary Institute and the Southern California Coastal Water Research Project are working on a project funded by the California Ocean Protection Council to help determine if different methods of measuring trash in the environment are reliable. The results, Hale said, could be used to guide municipal programs for trash monitoring. Choksi-Chugh calls the goal of total trash elimination "laudable" but says it should be, by now, producing visibly cleaner waters, which, she said, it's not. "We are seeing now that their plans to 'comply' bear little consequence on how much of their trash reaches the Bay," she wrote in an email. "The Board should be reevaluating their initiative and getting the cities on track to achieve meaningful trash reduction, instead of rubber-stamping compliance reports and patting everyone on the back." The unsightly shoreline of Richmond seems the most obvious place in the Bay to look for toxic runoff, effluent and dumping. The Ghost Fleet of Suisun Bay was another clear point source of pollution until, after decades of leaking metallic and chemical decay into the water, the last of 57 abandoned military ships was removed from the water in 2017. 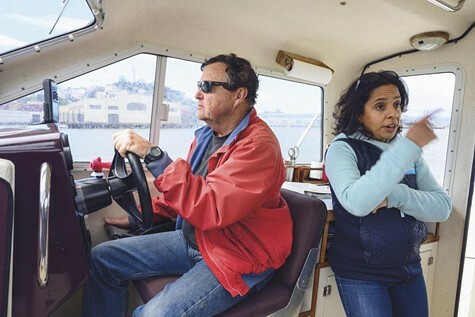 A similar, but much more furtive, threat to water quality lies about 30 miles by boat to the southwest of the former Ghost Fleet anchorage, in the protected waters of Richardson Bay. 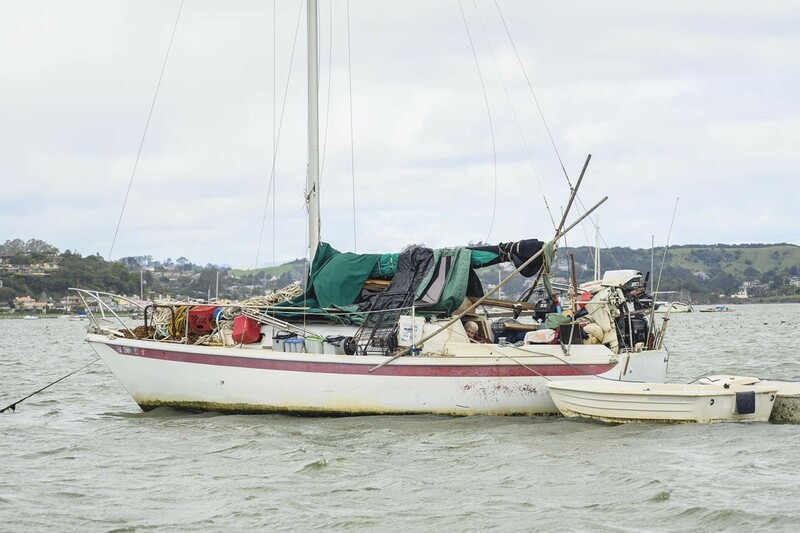 Here, a few hundred yards from the elite communities of Sausalito and the Tiburon Peninsula, a fleet of anchored boats has become the focus of controversy, a social justice issue, and a headache for activists trying to stem the flow of trash and contamination into the water. The boats — mostly sailing vessels — may once have been the pristine trophies of ambitious long-range sailors or weekend hobbyists, and their presence from afar gives one impression this is a high-status sailing destination. Closer up, that false aura fades. The boats are grimy gray, and many are packed with junk like a hoarder's overflowing garage. 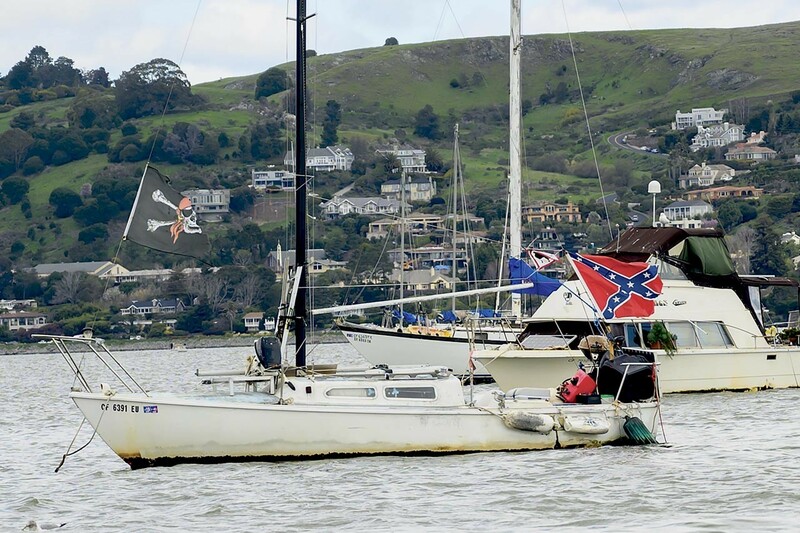 One small sailboat sports two prominent flags, which are fully extended in the stiff breeze — a classic skull-and-crossbones pirate's flag and a U.S. Confederate flag. The organization has been studying the problem of unpermitted live-aboards — essentially an extension of the region's terrestrial homeless crisis. Beth Pollard, the executive director of the Richardson's Bay Regional Agency, said that historically, the number of boats here has numbered about 75, with roughly half occupied. "Then came the 2008 recession," she said. This economic crash, often associated with the subprime mortgage crisis that cost so many people their homes, also caused many to abandon their boats. At the same time, many more people, abruptly without homes on land, took up living in boats on the Bay. As a result, the number of abandoned and occupied boats spiked. Pollard said that before the recent storms, some 200 boats were anchored in Richardson Bay. Some got swept away by high winds, and owners relocated others before and after the atmospheric rivers slugged the region. Currently, she said, the fleet numbers about 160. Human waste emissions from these boats gets more attention than the matter deserves, Pollard said. Landlubbers, even those with homes, pose a more voluminous problem. Sewage spills from treatment plants amount to a much greater environmental impact, she said. "People latch onto [the sewage issue], but it's a drop in the bucket compared to what cities release into the Bay," she said. Of much more concern are the boats' anchor chains. Many of the boats remain in place for months, if not years, at a time. Thus, as the winds change and the tide turns, the boats drift this way and that. This causes the heavy anchor chains to drag and scour the bottom, creating submarine crop circles in eel grass beds that are visible from the air when the water is clear enough to see the bottom. This, Pollard said, threatens the spawning grounds of Pacific herring, which enter the Bay by the hundreds of millions each winter to lay and fertilize their eggs on various surface types, including rocks and vegetation. As discussion ensues over how to regulate this community, nobody, Pollard said, has been evicted from Richardson Bay. The stakes, perhaps, are too high. With few other parts of the Bay offering such protective anchorage outside of marinas, it isn't clear where else they could safely go. Still, Choksi-Chugh and her organization are gaining some notoriety here among the live-aboards, not all of whom welcome their presence. As the San Francisco Baykeeper passes close to a weathered sailboat, a man standing plainly in the open, holding the mast for balance, jabs a pointed finger toward the central Bay — apparently wishing to see the Baykeeper disappear. On an adjacent, smaller boat cluttered with belongings, a salty, unhappy complexion appears from the cabin doorway. The whitehaired man shoves a middle finger at the watchful eyes on the Baykeeper. "He just flipped us off," a startled passenger says. Choksi-Chugh, busy prepping a water sampling kit, doesn't even shrug or look up. She is used to receiving accolades and, from deeper pocketed fans, grant money to keep the operation in action, and she is just as accustomed to adversity. "Yeah, they know who we are," she said. The SF Baykeeper putters along the pier of Levin-Richmond, the coal handler that lost the 2012 lawsuit from Baykeeper. Though the company followed orders to buffer its infrastructure and employ new practices with the goal of keeping coal and dust out of the air and water, it remains a concern to Choksi-Chugh. Return patrols, in fact, are a key part of Baykeeper's work to remind would-be polluters that they are still being watched. 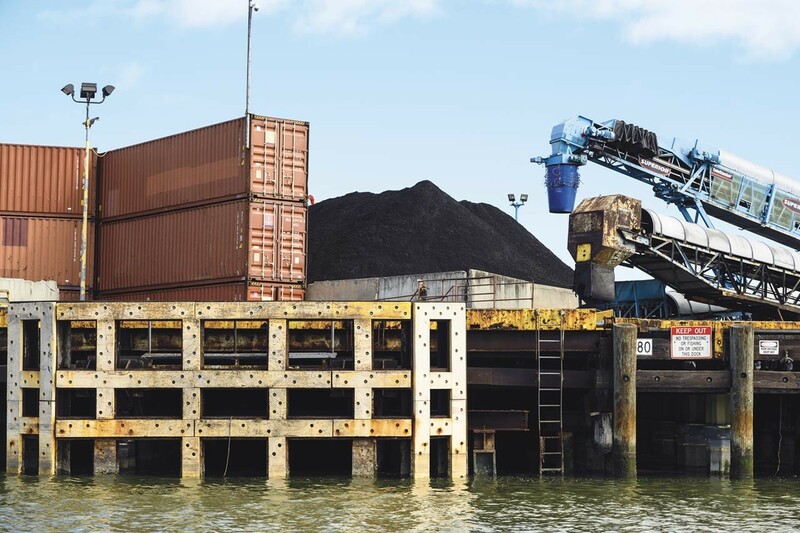 While Levin-Richmond is currently the only coal terminal on the shore of San Francisco Bay, some coal backers envision more as part of a black and sooty future that Baykeeper hopes to avoid. The push for more coal exports has been furtive, and Baykeeper first caught scent of it through a story several years ago in a small community newspaper in Utah explaining that four counties had approved $53 million in funding to build a coal terminal in Oakland. "What the hell do four counties in Utah care about a coal terminal here?" she says. As Baykeeper's office staff dove into an investigation, uproar followed, with Baykeeper and other groups and local leaders creating a community barrier against the project. The developer of the project, the Oakland Bulk and Oversized Terminal, sued the City of Oakland for stopping the project, and Baykeeper and the Sierra Club are now defending the city in court. Recently, Baykeeper left court victorious against a company that was mining sand from near Angel Island — essentially stealing it from the public, as the court ruled. "They fought us tooth and nail, and we fought them hard, and we just won, big-time," she said. "We won because the court ruled, for the first time in the history of the public trust doctrine, which says state resources belong to the state, that sand is a public resource and belongs to the public and must be protected." 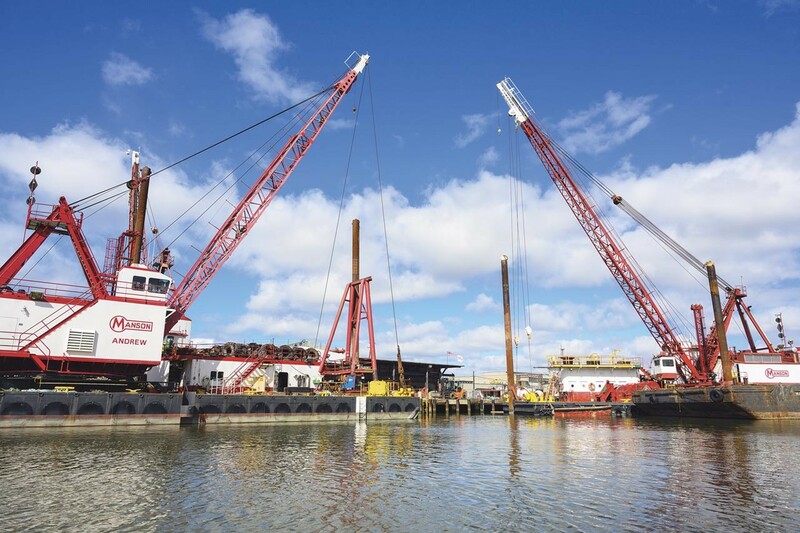 The sand that Hanson Marine Operations was taking out of the Bay and selling to construction companies is the same sand that originates in the highlands of the Sacramento-San Joaquin watershed. Eventually, it migrates through the Bay, supporting the spawning activity of California halibut and Dungeness crab. Then, it exits the Golden Gate and begins southward, along Ocean Beach, each grain part of huge and complex global sand cycle that scientists are still trying to better understand. Choksi-Chugh, toughened by past battles, seems ready as ever to take on future ones. Her experience in environmental litigation and watchdogging shows when she gets talking. 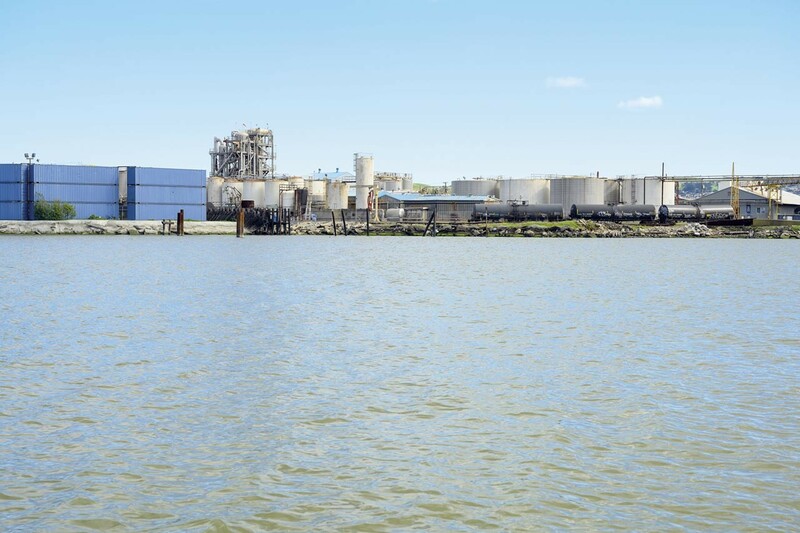 "We have five refineries, one coal terminal and three more being proposed, 86 different stormwater systems that are dumping pollution in the Bay, we have 42 wastewater treatment plants, we have 1,640 industrial facilities," she said. 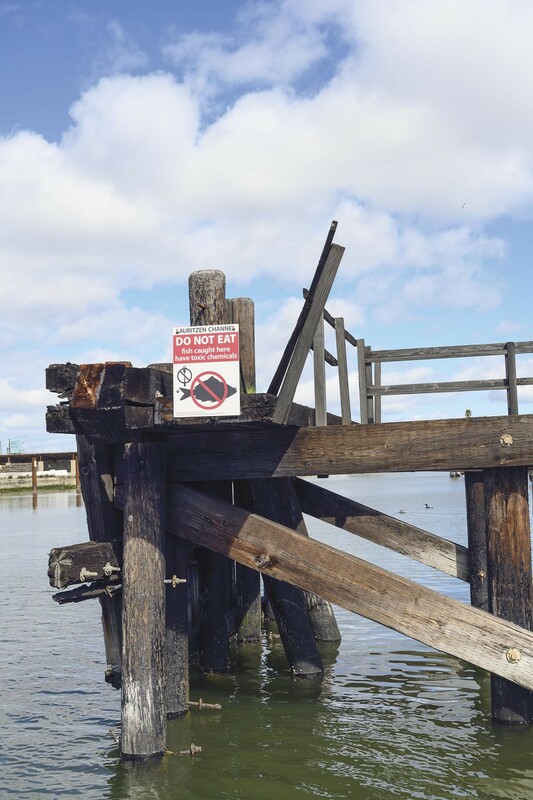 "There's 1,147 Superfund or other toxic sites around the Bay." She laughs at her own encyclopedic memory. "I've been doing this a long time," she said. There are big fish out here to catch, and to later fry in court, but for a moment, Choksi-Chugh becomes fixated on a smaller-scale mission. She grabs a long-handled fishing net from the cabin of the boat and steps outside. "Can you back up just a few feet?" she asks the skipper, Robert Fairbank, a Baykeeper volunteer of about 10 years' experience. He reverses the throttle and smoothly steers the boat backward, edging closer to Levin-Richmond's pilings, into the shade cast by the dock above. She reaches out, her feet extended to counterbalance her forward bodyweight and keep from tipping into the green soupy water. She makes a quick jab with her arm, then pulls in the catch of the morning: a small plastic bottle. 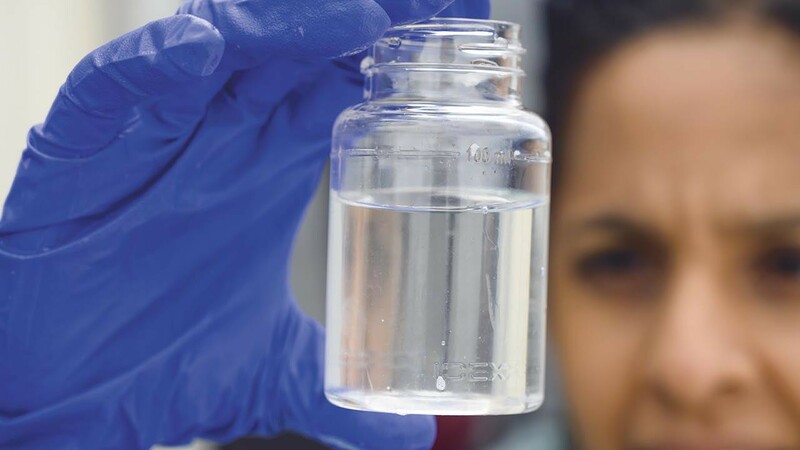 Where there is one such item today there would have been five in 2009, when the Bay Area Regional Water Quality Control Board launched its plan to rid the environment of waterborne trash. That's the theory anyway, though it seems unlikely. Less likely is that all trash will be eliminated by 2022, as the water board intends to do, but Baykeeper and other groups will be watching, and counting. Other trash remains floating in the waters of Lauritzen Canal, and Choksi-Chugh's effort comes off as an act of slapstick futility. She begins to laugh uncontrollably. As the boat motor revs and the SF Baykeeper starts toward the mouth of the small, toxic cove, she returns to the cabin, tosses the bottle into a trash basket to be recycled later. A passenger jokes, "Mission accomplished!" Should We Break Up PG&E? Or should we turn the scofflaw company into a public agency?